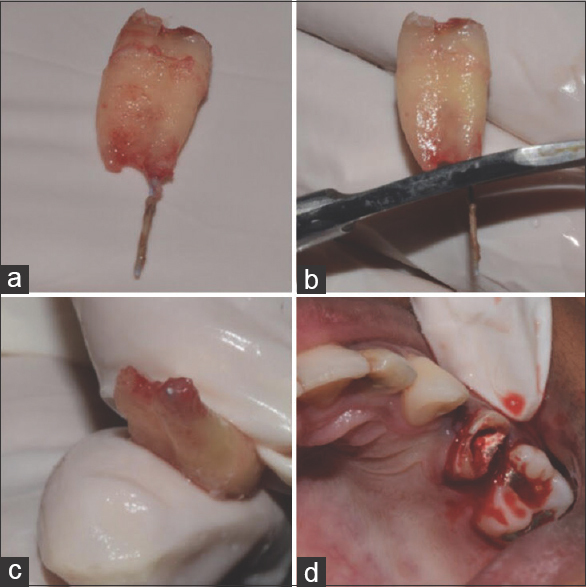 The aim of this case report is to highlight the importance of intentional reimplantation as an alternative to endodontic surgery, where due to the vicinity of critical anatomical structures, surgical approach was risky. Atraumatic extraction was performed followed by the removal of previously extruded gutta-percha, re-root canal treatment, and along with root-end filling with mineral trioxide aggregate, preceding reimplantation. In endodontics, IR involves the atraumatic extraction of the offending tooth, root canal preparation and filling/root-end resection/root-end preparation/root-end filling, and reinsertion of the extracted tooth. IR has an advantage that it provides the combined benefit of retreatment and periradicular surgery procedures with less time and effort and is less invasive as compared to surgery. It can be performed even by general practitioners and without specialized equipment and instruments such as microscope. IR is indicated when conventional root canal therapy, nonsurgical retreatment, and surgical retreatment have failed, proximity to vital structures such as maxillary sinus, mental nerve, etc., where accessibility is poor for surgery, persistent chronic pain, accidental exarticulation, involuntary rapid orthodontic extrusion, patient objection to surgery, etc. It is contraindicated in flared or curved roots, periodontal involvement, and broken tooth. A 20-year-old female patient reported to the department of conservative dentistry and endodontics with the chief complaint of pain in the upper right back tooth region. She gave a history of endodontic therapy 6 months back with tooth 15. Intraoral examination revealed pain on percussion in 15 whereas extraoral and periodontal examination showed no abnormality. Radiographic examination [Figure 1] of 15 showed approximately 7 mm over extended root canal filling with large periapical radiolucency. The patient was willing to extract the tooth. The patient was informed about the case, and possible treatment plans were then discussed. 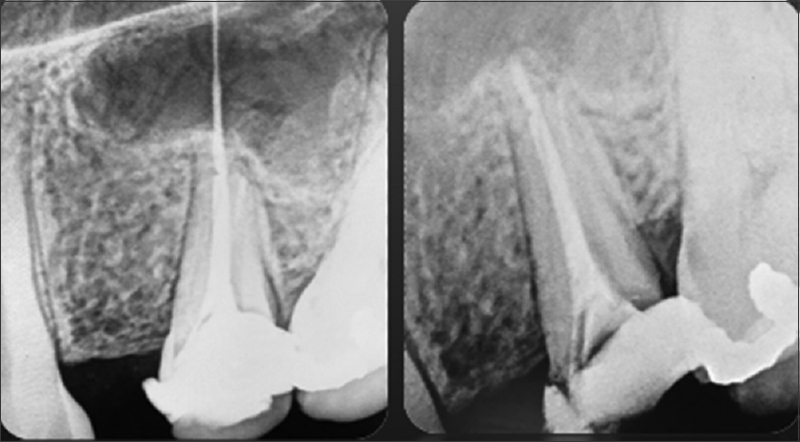 All possible treatment options were explained to the patient including (i) tooth extraction, (ii) retreatment followed by coronal restoration, (iii) periradicular surgery, and (iv) to extract and replant the tooth immediately after carrying out external re-endodontic treatment and root-end filling with MTA as a last resort. The risks and benefits of each option were thoroughly explained, and the patients signed a written informed consent. Periradicular surgery was eliminated as the extended gutta-percha (GP) was in the maxillary sinus. The IR treatment plan offered better success rate, so it was acceptable to the patient with the understanding that extraction would remain the only choice in case of failure to atraumatic extraction. In the present case, the patient was asked to rinse her mouth with chlorhexidine gluconate solution (0.12%) and local anesthesia was administered followed by atraumatic extraction with extraction forceps and elevators were not used to prevent damage to periodontal ligament (PDL) and fracture of the tooth as seen in [Figure 2]a. The tooth was inspected after extraction for any fracture to reassure the extraction to be atraumatic. Overextended GP was then cut from the apex [Figure 2]b. Nonsurgical retreatment was then performed using universal ProTaper till size F3 (0.30/0.09), and copious irrigation was done using 5.25% sodium hypochlorite and saline followed by 17% liquid ethylenediaminetetraacetic acid on the extracted tooth. The canal was then obturated using F3 GP point and AH Plus sealer. The tooth was constantly kept moist with normal saline and was held by the edges so that PDLs do not get damaged. 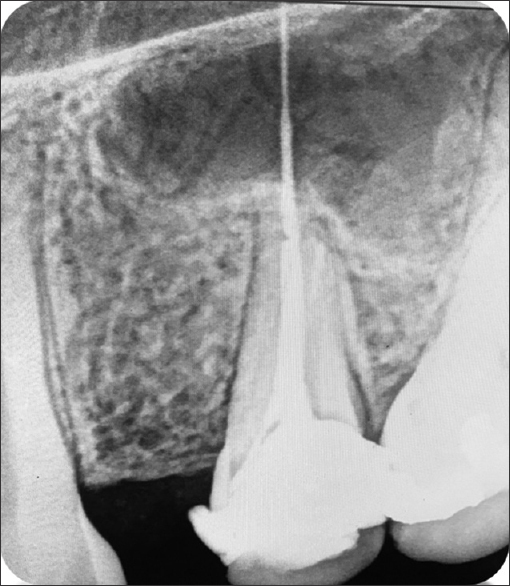 The root-end cavities were then prepared (3 mm) and sealed with MTA [Figure 2]c. Extraction socket was irrigated with normal saline and suctioned to remove blood clots. Tooth was then reinserted with finger pressure and pushed apically to appropriate depth and was kept intentionally extruded to provide for adequate ferrule for future treatment [Figure 2]d. Postreimplantation radiograph was then taken to reassure the position and depth of the tooth inserted. [Figure 3] compares the preoperative and postoperative radiograph which shows successful reinsertion of the tooth. There are several key factors that must be considered when choosing a clinical option like IR that includes: (1) patient factors and physical limitations; (2) endodontic and anatomic tooth factors; and (3) operator factors. Among which, operator factors are the most significant as the practitioner should have the skill and confidence for atraumatic extractions. Clinical comfort, absence of symptoms, return to function, and radiographic resolution are all factors that indicate successful outcome for IR. Factors that encourage healing are reduction in extraoral time, atraumatic extraction/reinsertion, prevention of damage to tooth roots, adequate apical seal in terms of depth, material compaction, and characteristics as well as suitable case selection. The first two features prevent dehydration and damage to PDL cells which are essential in the periradicular healing process and prevention of resorptive processes such as replacement resorption, ankylosis, and internal and external root resorptions. Extraoral time is probably the most important factor; we decided to perform the retreatment outside the mouth which increased the extraoral time. Performing the retreatment before extraction would have led to the separation of apically extruded GP from the intracanal GP making the removal of extruded GP highly unpredictable. Hence, it was decided to perform retreatment extraorally. To provide the best long-term prognosis for a tooth that is to be replanted intentionally, the tooth must be kept out of the socket for the shortest period possible, and the extraction of the tooth should be a traumatic to minimize damage to the cementum and the PDL. The PDL attached to the root surface should be kept moist in saline, Hank's buffered salt solution, Viaspan, or doxycycline solution for the entire time the tooth is outside the socket. IR should be the last resort when all other treatment modalities fail. Bender suggests that IR must be considered as a routine treatment modality than a last resort if 75% of bone support persists and minimal tooth mobility. There are some absolute contraindications, for example, in immunocompromised/suppressed patients, teeth with potential high risk of fracture/trauma (divergent rooted molars), poor patient compliance, and oral hygiene. Periodontally involved teeth or fractured teeth may have lower prognosis with IR though the research for an excellent biomaterial is ongoing for these cases. Apart from infection, resorption is also a key reason why IR and traumatically avulsed teeth fail. Missing PDL or necrotic cementum due to excessive extraoral time, dehydration, and/or trauma may cause replacement resorption or ankylosis. In our cases, the IR process spanned between 8 and 14 min. The patient in the above case will be recalled every 6 months for clinical and radiographic evaluation for next 2 years. The fact whether the tooth functions in the future depends on various factors and is beyond the scope of this article. The patient was even ready for extraction, but availability of this treatment modality made it possible to save it. With careful case selection and suitable training, IR can have a high success rate with bioregenerative material and be far less expensive than other treatment options. This study was financially supported by the Department of Conservative Dentistry and Endodontics, Bharati Vidyapeeth Dental College and Hospital, Navi Mumbai, Maharashtra, India. Raghoebar GM, Vissink A. Results of intentional replantation of molars. J Oral Maxillofac Surg 1999;57:240-4. Al-Hezaimi K, Naghshbandi J, Simon JH, Rotstein I. Successful treatment of a radicular groove by intentional replantation and emdogain therapy: Four years follow-up. Oral Surg Oral Med Oral Pathol Oral Radiol Endod 2009;107:e82-5. Asgary S. Management of a hopeless mandibular molar: A case report. Iran Endod J 2011;6:34-7. Peer M. Intentional replantation – A 'last resort' treatment or a conventional treatment procedure? Nine case reports. Dent Traumatol 2004;20:48-55. Nasjleti CE, Caffesse RG, Castelli WA. Replantation of mature teeth without endodontics in monkeys. J Dent Res 1978;57:650-8. Tözüm TF, Keçeli HG, Serper A, Tuncel B. Intentional replantation for a periodontally involved hopeless incisor by using autologous platelet-rich plasma. Oral Surg Oral Med Oral Pathol Oral Radiol Endod 2006;101:e119-24.